Since turning thirty, I have replaced triathlon with gardening, late night bars with late night milk bottles, and Radio 1 with Radio 4’s Women’s Hour. Whilst listening to the latter, I was particularly struck by a feature on ‘Shaping the Body: 400 Years of Fashion, Food and Life’, which was based on an exhibition at York Castle in Spring 2016. The exhibition promises ‘an iron corset, crotchless pantaloons from the time of Jane Austen, bum rolls and a killer dress’. Not only did I find the discussion about the exhibition fascinating in itself, it struck a particular chord with me because of the link I immediately made with some recent Year 9 books I had marked. Last term my Year 9 group was given an open homework research task, in which they were to identify and then illustrate 15-20 important events that took place in the twentieth century. Most pupils, like many Year 9 students before them, chose significant political, economic and social events that transcended many different themes and nation states. A typical example was to move from the end of the Second World War, to Marilyn Monroe, to the IRA. Three students, however, took a particular angle on the timeline task that I had never seen before: their timelines were centred entirely around fashion labels. Instead of the Treaty of Versailles and the Collapse of the Soviet Union, there was Christian Dior, Coco Chanel, Calvin Klein, and other designers waving their couture labels from different years in the timeline (and from different letters of the alphabet). The connection I made between Women’s Hour and the work of these three Year 9 girls was extremely satisfying. Here was a subject that was fascinating, unique and wonderfully congruent: the feature on Women’s Hour described how wider socio-politico-economic events affected fashion. 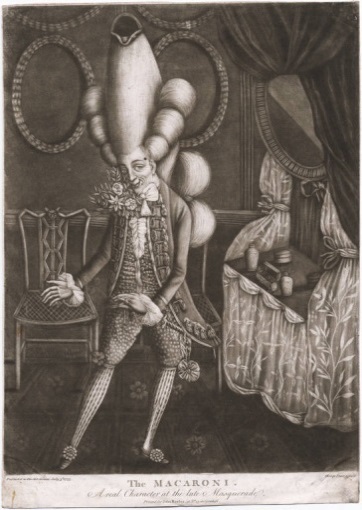 For example, increasing travel in the eighteenth century led to the ‘Macaroni’ man (as shown in the picture ), whose clothes were based on some outrageous Italian designs. Another example is the effect of World War I on the role and status of women, which led to the emergence of Flappers. Could fashion be an overriding ‘theme’ to tie together previous depth studies into a large-scale narrative? Making judgements about overview and depth, planning for the way that parts relate to wholes and wholes relate to parts, is a very important strand within the British history education tradition. An excellent starting point in teaching overview is given in the ‘New, Novice or Nervous’ feature in Teaching History Number 157. Grappling with the design of a coherent overview enquiry, in which pupils can illustrate a ‘big picture’ of the past, or construct their own ‘big narrative’, is no mean feat, as the editors of Teaching History demonstrate. These connections, between fashion and the historical context, led me to create my enquiry question, which was focused upon historical change: When in 1700-2000 was fashion a victim of events? I carefully crafted this question to focus the pupils’ judgements upon when historical events and processes had the most significant impact upon people’s clothing, and when fashion was unaffected by events. It also allowed me to raise the question of whether a large impact on fashion meant that the historical change was more or less significant. A study of changes in British fashion would therefore help my pupils to create an overview of the events they had been studying across the eighteenth, nineteenth and twentieth centuries. It would also, I hoped, help pupils to ‘gain historical perspective’ as mentioned in the 2013 National Curriculum, by placing pupils’ growing knowledge into a long-term cultural context. It would also provide an excellent contrast with the history we had spent quite a bit of time studying in the past two terms; juxtaposing petticoats, A-line skirts and knee-breeches with D-Day, hedgehog anti-submarine weapons and the rise of Hitler would, I hoped, help pupils to see a broader scope of past events and trends. It might also help me, I thought optimistically, bring the attention of those three Year 9 girls back into the History classroom, and away from doodling on their Superdry backpacks. As we are reading each fashion factsheet, draw a very simple sketch of clothes that were typical at the start and end of each century on your whiteboard. You may add some labels if you wish! Based on what you have read for each century factsheet (and what you have learnt this year), choose which five ‘broad trend’ cards fit that period. Add these to the correct place on the blank A3 timeline. Now add the twenty date cards to the correct place on your timeline. Be ready to peer-assess your timelines, with points scored for each event placed in the correct sequence! Draw outlines of clothes worn in each century at an appropriate place in your timeline. Inside the outline, summarise what wider social, economic or political events or trends had the most significant impact on fashion. Be prepared to justify your decisions. You can find the resources for these tasks on the Resources page. The first thing I noted was how galvanised the girls were by the enquiry. They clearly noted the lesson’s implication, and its accompanying flattery: Mrs Lobo has recognised my interests and created a special enquiry, just for us. I had anticipated a little boredom from the boys when reading through the fashion factsheets, but the interest of nearly all of them was kept by constant questions such as ‘what did the frilled underdrawers look like? Did the men pretty much wear knickers?’ and ‘What’s a dandy?’ Next time, I’ll pop up even more images of the clothing to illustrate how the men and women dressed. Drawing images of the clothing to illustrate what they had learnt divided the pupils into enthusiasts and ‘I can’t draw’-ers, just as many other tasks divide the pupils into those who like writing – and those who don’t. It was a refreshing change to a Point-Evidence-Explain paragraph, however. The selection of broad trend cards appeared to be quick and easy for most, whereas the placement of the twenty date cards in chronological order was very challenging. Despite structuring our Year 9 scheme of work using connected depth studies that are taught to students in chronological order, this order had clearly been lost on most of the pupils. What was missing, I reflected, was regular reminders about chronology. Next year I hope that regular timeline tests, such as those recommended by Carr and Counsell in their illuminating article in Teaching History Number 157, would help pupils to navigate the big map of the past more confidently. In short, they needed exposure to overview enquiries more frequently (as Michael Riley has often advocated), rather than bolting one on at the end. The outcome of the enquiry was to identify times within the period 1700-2000 when fashion and contemporary events and actions coincided. This was fairly straightforward for twentieth-century events such as the Second World War and the Swinging Sixties. Yet more subtle changes, such as the impact of empire and the industrial revolution upon fashion were more difficult connections for many pupils to make. Once these connections had been established, however, we spent a very enjoyable five minutes discussing Google glasses, Apple watches and David Beckham. Whether the pupils could see the connection between the Macaroni Man and David Beckham was not discussed – but it would be an amusing question to ask next year’s fashion victims.